Belief systems are installed at multiple layers of Maslow’s Hierarchy of Needs. Popular religions do this at most or all layers. Books about business, relationships, etc, do this at singular layers. Someone can be Christian and yet also base their entire Belonging layer belief system in How to Win Friends & Influence People. In this sense, everyone is multi-religious. • Allows belief system installation without threatening core beliefs. 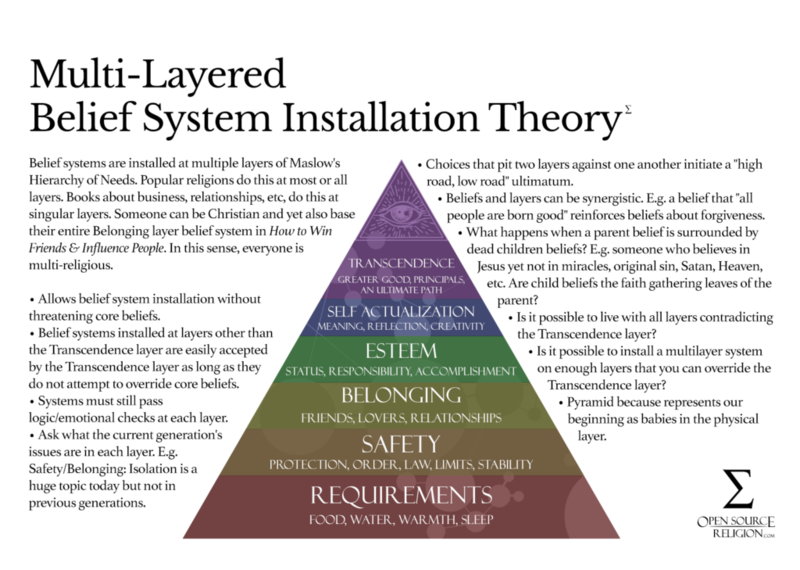 • Belief systems installed at layers other than the Transcendence layer are easily accepted by the Transcendence layer as long as they do not attempt to override core beliefs. • Systems must still pass logic/emotional checks at each layer. • Ask what the current generation’s issues are in each layer. E.g. Safety/Belonging: Isolation is a huge topic today but not in previous generations. • Choices that pit two layers against one another initiate a “high road, low road” ultimatum. • Beliefs and layers can be synergistic. E.g. a belief that “all people are born good” reinforces beliefs about forgiveness. • What happens when a parent belief is surrounded by dead children beliefs? E.g. someone who believes in Jesus yet not in miracles, original sin, Satan, Heaven, etc. Are child beliefs the faith gathering leaves of the parent? • Is it possible to live with all layers contradicting the Transcendence layer? • Is it possible to install a multilayer system on enough layers that you can override the Transcendence layer? • Pyramid because represents our beginning as babies in the physical layer.